The Wildcats celebrate an emotional senior day at Friday's meet at the Norris Aquatics Center. 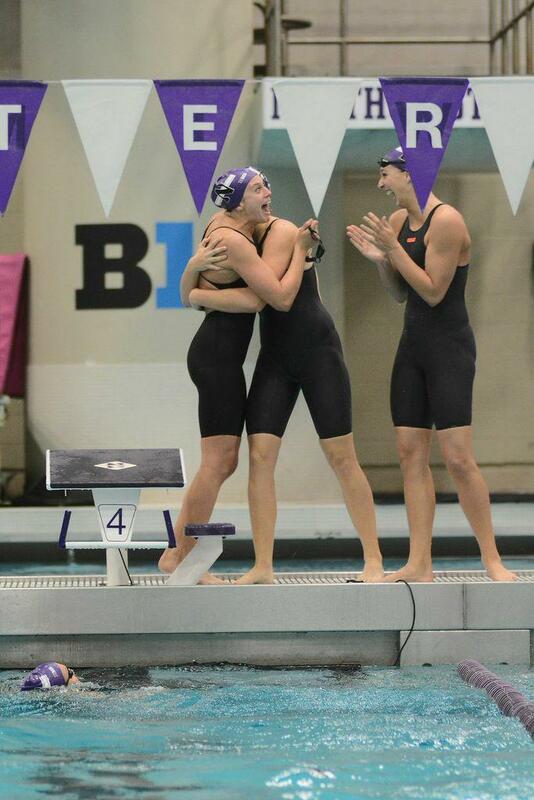 Northwestern won all 11 swimming events in the competition against the Milwaukee Panthers. Northwestern honored two swimmers on its annual senior day Friday, as the Wildcats (6-4, 1-2 Big Ten) beat Milwaukee 153-81 in their last home meet of the season. The Panthers (4-3, 2-1 Horizon League) were no match for the Cats on Friday, never really threatening to compete on NU’s home turf. Despite a high scoring meet for the Cats overall, coach Jimmy Tierney noted a progression in performance throughout the competition. “I thought that some of the girls were a little flat earlier on and that the energy built a little bit,” Tierney said. “Our opening relay was pretty solid so I was pleased with that, and then there was sort of spotty performances in the next few events. I felt like we kind of picked it up a little bit more after the first break.”Madeleine Klichowski and Valerie Nubbe, the only seniors on the team, were recognized Friday for their four years of work at NU. Tierney was proud of the pair of soon-departing swimmers, complimenting their execution, energy and effort.A highlight of the meet was the last event, the 200 free relay, which included the NU team of junior Julia Pratt, sophomore Annika Winsnes, freshmen Anna Keane and Mary Warren. The relay swimmers came in first with a time of 1:31:07. Underclassmen were big contributors to more than one event on senior day. In the 400 medley relay, the team of junior Julianne Kurke, sophomores Lacey Locke and Winsnes and freshman Maddy Sims pulled away with a victory in the first event. Sophomore Lauren Abruzzo won the 200 freestyle and Locke won the 200 backstroke. Sophomore Ellen Stello also had impressive victories in the 200 fly and 500 free. Junior Ellen Anderson won her first dual-meet event this year, when she placed first in the 1,000 free with a time of 10:15:05. Yet the younger NU swimmers made sure the spotlight was on their eldest counterparts. NU will be on the road against Iowa on Saturday, in hopes of getting back to .500 in Big Ten competition.